New Arktau Eos live date! 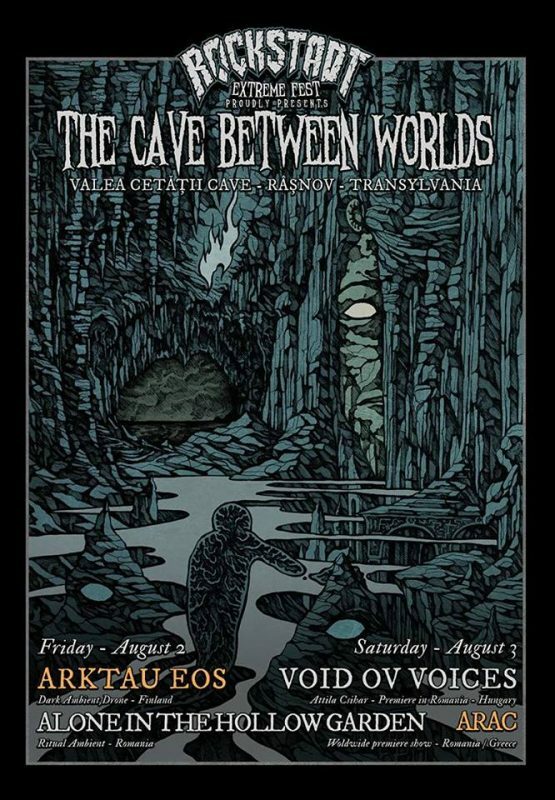 Arktau Eos are pleased to return to Romania to perform an exclusive set at the magnificent Valea Cetății Cave near Râșnov. 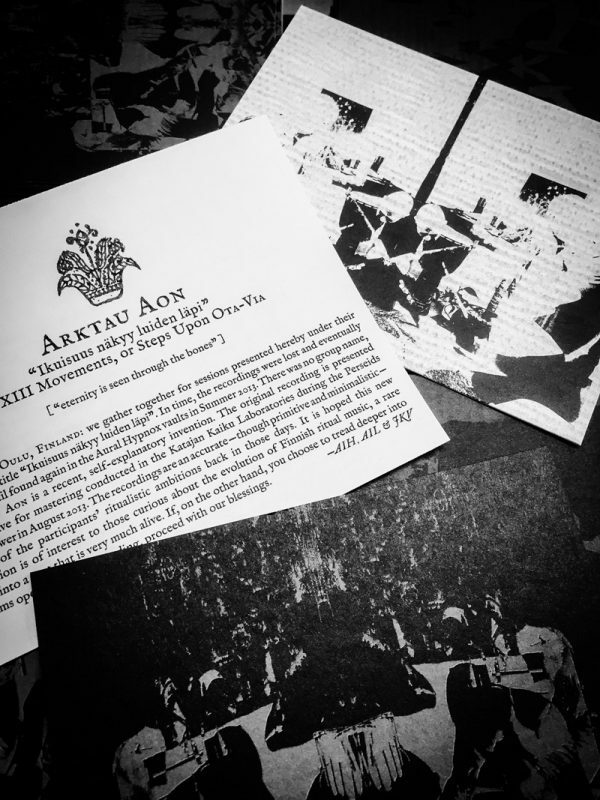 Continuing their late 2018 explorations of subterrannea in the Pyrenees, Arktau Eos cherish this possibility to inquire further into the mysteria of primordial chthonic sonics in such one of a kind milieu. Care will be taken to protect the environment and its attendant fauna, therefore the capacity will be extremely limited. Arktau Eos live at Phobos X online! New live date: Zoät-Aon 28.9.2019! 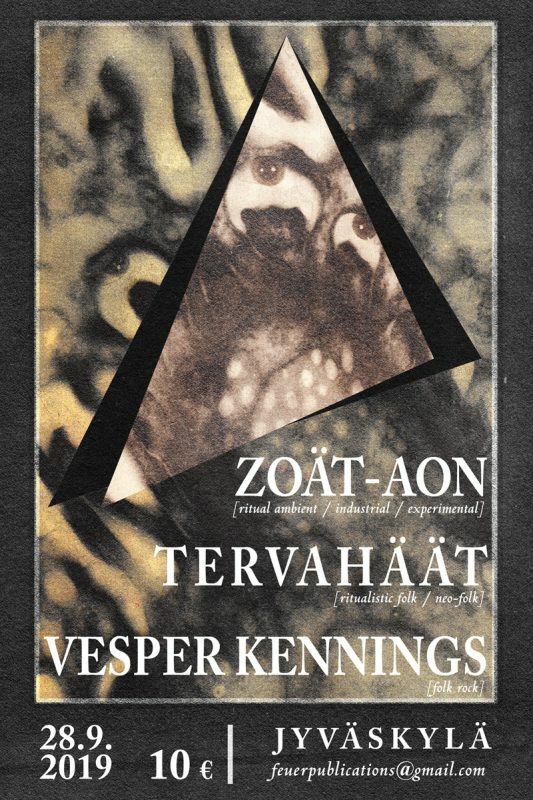 Zoät-Aon will be performing with Tervahäät & Vesper Kennings in Jyväskylä on 28th of September! Out now: Arktau Aon “Ikuisuus näkyy luiden läpi”, CD (2nd edition)! Back in stock after a long period of unavailability: Arktau Aon “Ikuisuus näkyy luiden läpi”, CD! Thought lost and subsequently forgotten, a complete album by AIH & AIL of ARKTAU EOS and JKV of ZOÄT-AON was recently rediscovered. 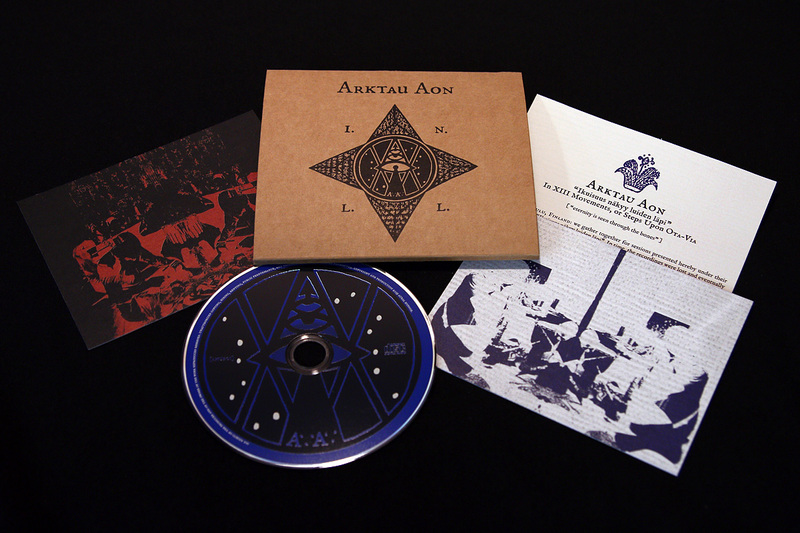 This unknown chapter in the evolution of the classic Finnish ritual sound originates from sessions held in May 2005, when Arktau Eos was still unnamed, beginning work on their seminal opus ‘Mirrorion’ and Zoät-Aon had just released the equally influential ‘Star Autopsy’ CD. The album retains the original title of the sessions: ‘Ikuisuus näkyy luiden läpi’, Finnish for ‘Eternity Shines Through the Bones’, and for purposes of this release the group is named simply ARKTAU AON. ‘Ikuisuus näkyy luiden läpi’ is enthusiastic, youthfully vigorous and decidedly ominous ritual music with a total running time of 31:53. Instead of songs, it is divided into different ‘movements’ or phases: it resembles a field recording of some obscure ceremony from a far-off corner of the world. Boasting a raw but good, clear sound, ‘INLL’ remains unaltered save for the mastering done in 2013 at Katajan Kaiku studio. The album is enclosed inside a screen printed covers including a textual and two two-sided inserts. Limited to 250 copies. Arktau Aon “Movement I” now on SoundCloud! Arktau Aon “Movement I” from the “Ikuisuus näkyy luiden läpi” album now on SoundCloud! Arktau Aon “Ikuisuus näkyy luiden läpi” 2nd edition nearing completion! Working hard to have everything ready for tomorrow!